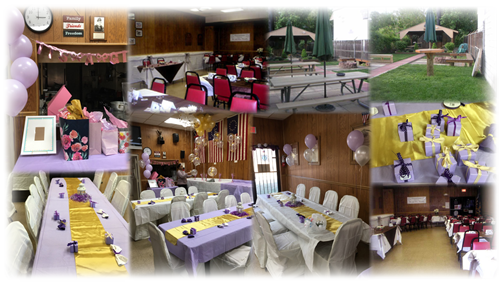 Phillips-Kleiner VFW Post 5627 has the perfect hall rental option for those smaller functions. We can comfortably accommodate up to 50 people. Hall rental includes the free use of our kitchen, outdoor pavilion and oversized, charcoal grill. If you are interested in renting our hall for a function of your own, then please peruse the information on this page and give us a call with any questions you may have. No live bands, cabaret nights, casino nights, etc. In accordance with Maryland State Law, you may not bring your own alcoholic beverages onto Post property. Hall rental prices are based upon individual circumstances and are subject to change without notice. Currently, we offer two different rates for the rental of our hall, an economy rate and a regular rate. Please keep in mind that the rates listed on the right are meant only to provide our web site viewers and potential hall renters with a general cost estimate. No hall rental agreement will be considered valid until a contract is signed. Please read over the following information and if you have any questions, feel free to give us a call. This rate is usually reserved for smaller, daytime functions such as baby showers, meetings, small wakes, luncheons, functions that do not require extensive use of the kitchen and food storage facilities, etc. This rate is usually reserved for any function that requires the Post to stay open past our normal closing time, which is 9:00 pm, functions that require the use of the outdoor pavilion area, functions that require extensive use of the kitchen and food storage facilities, etc. If you have trouble downloading or printing the hall rental agreement, you may need to download or update the FREE version of Acrobat Reader. © Phillips-Kleiner VFW Post 5627, 2018.